Exchanging of the partnership agreement between Sri Lanka Telecom and Mobitel Chairman with Mr. P. G. Kumarasinghe Sirisena and Citibank the Citi Country Officer Mr. Ravin Basnayake. Also present were (from left) Mobitel Senior General Manager Human Resources / Legal & Regulatory Affairs Mr. Namal Ratnayake, Mobitel Chief Financial Officer Mr. Sudharshana Geeganage, Mobitel Chief Executive Officer Mr. Nalin Perera, Citibank Director, Head - Corporate & Investment Bank Mr. Kavinda de Zoysa and Mobitel Senior General Manager Engineering & Operations Mr. Rasantha Hettithanthrige. 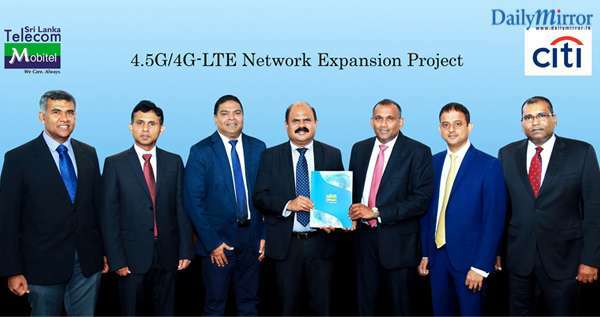 Mobitel, Sri Lanka’s National Mobile Service Provider has embarked on the biggest and most significant 4.5G/4G-LTE Network expansion in Sri Lanka. This is the largest investment in network infrastructure funded through financing facilities of Citibank. Mobitel will increase the country’s 4.5G/4G-LTE coverage, thereby strengthening its No.1 status for High-Speed Mobile Broadband in Sri Lanka, having already received the Globally-acclaimed Ookla® Speed Test Award for 2017 with similar investments. Mobitel was the first to commercially deploy 4.5G/4G+ in South Asia, and the network expansion will also include upgrades to keep Sri Lanka at the forefront of technology leadership by offering wider coverage of 4.5G/4G+, NB-IoT (Narrow Band Internet of Things) services to its customers, and modernizing its network with NFV/SDN technologies and host of other next generation platforms to make it more agile, thus paving the way for easy adoption of 5G in the near future.